The streets of Boston belong as much to residents who don’t drive as those who do. So it’s gratifying that the city is testing out new approaches to divvying up street space by experimenting with non-traditional uses for parking spaces. 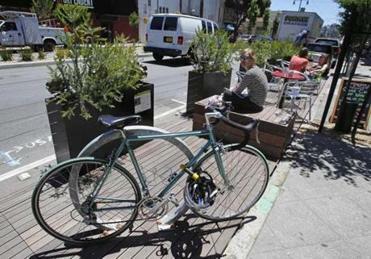 That includes the removable bike-sharing stations deployed as part of the Hubway program, and a new city pilot program to convert a handful of parking spaces into three-season “parklets” with benches and planters. Four parklets are in planning stages, including one in front of Wholy Grain in the South End. And why not? If someone suggested tomorrow that Boston should give valuable urban real estate away for next to nothing, the idea would go nowhere. Yet that’s what happens now with parking spaces, which are either offered free or are steeply discounted from market rates — with little discussion about whether that’s a wise policy. Of course, there is a good case that subsidizing parking is worthwhile, providing an amenity to residents and visitors. Some on-street parking ought to remain part of any balanced cityscape. But how to strike that balance is a debate few cities have had. Giving Bostonians a little more space to sit and talk and eat during warm weather will make for a livelier streetscape than giving one or two more motorists a place to park.